The Royal Mint entered the race to attract investors interested in Chinese Lunar Calendar coin designs with the introduction of its own lineup in 2014. 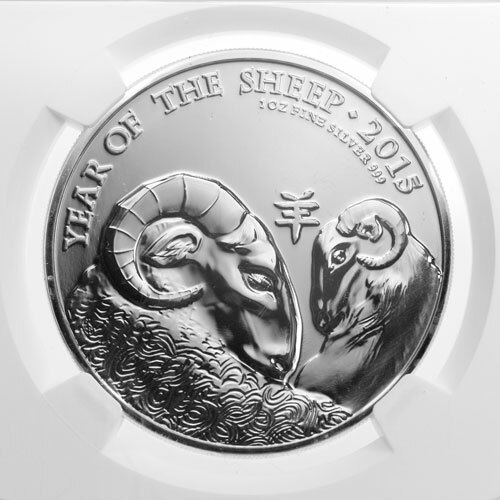 Now, as we enter the Year of the Sheep, the Royal Mint has introduced the second coin in the series designed by a British-Chinese artist. 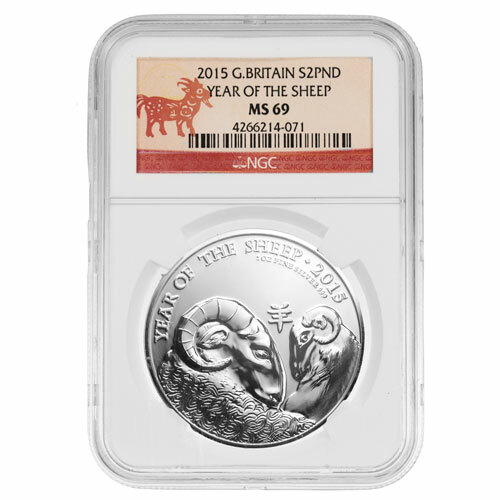 The 2015 1 oz British Silver Year of the Sheep Coin is now available from Silver.com in near-perfect condition. Just 160 coins exist in this grade! Bears a face value of £2 (GBP) backed by the government of the United Kingdom. Available with a protective plastic slab courtesy of the NGC. Britain’s first Lunar Series coin was unveiled in 2013 when it added a snake privy to the outer rim of its Britannia coin. In 2014, it launched a full Lunar Coin Series featuring designs from artist Wuon-Gean Ho. She intricately designed the images used on this year’s coin, and is signed on with the Royal Mint to complete all 12 coins planned for release in the coming years. 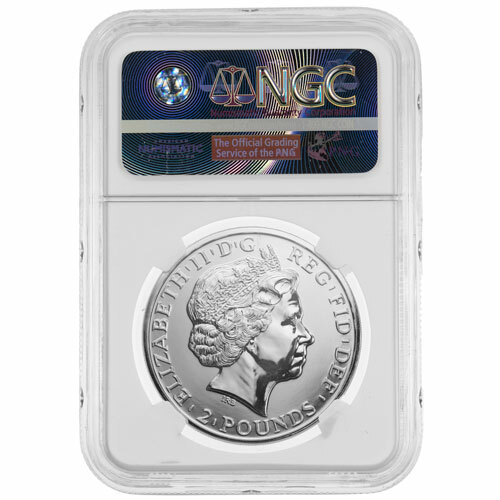 Each of the coins available to you through this product listing are available with a near-perfect grade. This means that each coin has its full, original luster, and no more than two minor detracting flaws, blemishes, or contact marks. In most cases, these flaws are only visible with magnification and are not visible within the primary focal areas. On the reverse side of the coin is the image of two different sheep facing each other. While the distant sheep is easily visible, the sheep that is closer is visible with intricate detail. Its curly coat and steely glaze are easily seen on the coin’s surface. Engravings include “Year of the Sheep,” “2015,” the weight, metal content, and purity of the coin, as well as the Chinese symbol for sheep. 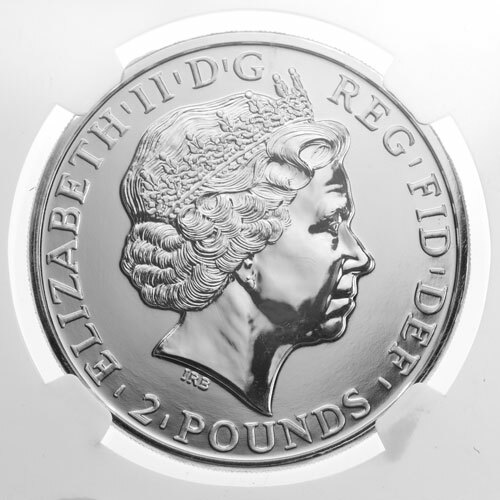 The reverse of each coin features England’s Queen Elizabeth II in right-profile relief. Her Majesty’s image is surrounded by the engravings “Elizabeth II,” “D’G,” “Reg’Fid’Def,” and the face value. If you have any questions about these coins from the Royal Mint, don’t hesitate to reach out to a Silver.com associate at 888-989-7223. You can also reach us online through our live web chat or send us an email. Looking for similar coins? Be sure to check out our full selection of Silver British Britannia Coins.